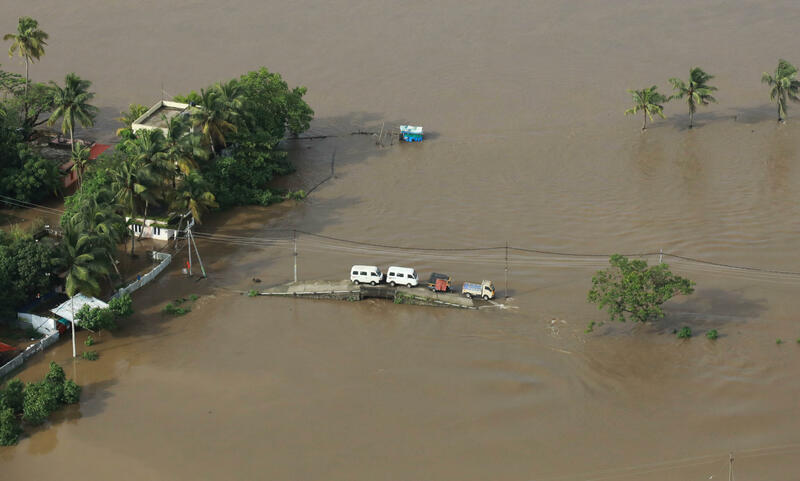 CHENGANNUR, India — About 800,000 people have been displaced and more than 350 have died in the worst flooding in a century in southern India's Kerala state, authorities said Sunday. Rescuers are continuing to search for residents who are stranded in the worst-affected areas. Weather officials have predicted more rains across the state through Monday morning. In several villages in the suburbs of Chengannur, one of the worst-affected areas, carcasses of dead cattle were seen floating in muddy waters as water began receding. However, vast rice fields continued to be marooned and many vehicles were submerged. In some villages, the floodwaters had entered homes. Rescuers in a motorboat reached a hamlet where they tried in vain to persuade an 80-year-old woman, Bhavani Yamma, to be taken to a government-run shelter from her partially submerged single-story house. At least two trains carrying about 1.5 million liters, 400,000 gallons, of water moved to the flooded areas from the neighboring states of Madhya Pradesh and Maharashtra on Sunday, Indian railway official Milind Deouskar said, according to the Press Trust of India news agency. Officials estimate that more than 10,000 kilometers, about 6,200 miles, of roads have been damaged. One of the state's major airports, in the city of Kochi, was closed this past Tuesday due to the flooding. It is scheduled to remain closed until Aug. 26. Officials have put initial storm damage estimates at nearly $3 billion. At least 250 people have died in the flooding in a little over a week, with 31 others missing, according to Kurian. More than 1,000 people have died in flooding in seven Indian states since the start of the monsoon season, including over 350 in Kerala.